Here’s why you might want to be involved with your cover design, even—or especially—if your book is being designed by one of the major publishing houses. 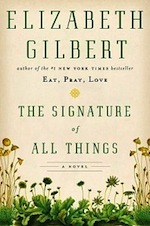 Elizabeth Gilbert’s The Signature of All Things, released October 1, 2013 by Viking, has a beautiful cover. 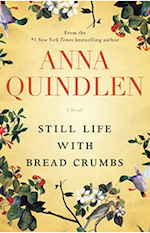 Remarkably similar is the cover of Anna Quindlen’s Still Life with Bread Crumbs, due out on January 28, 2014 from Random House. Coincidence? Perhaps. Or maybe it’s an indication that even the big guys are susceptible to visual trends. And, on a related note: I recently spoke with an author whose book will be released in the spring of 2014 by a mid-sized publisher, and the author was frustrated about her cover design. The publisher had presented the author with several cover options, none of which (IMHO) appropriately represented the content of the book. The author worked with an independent cover designer to provide several alternative (and more appropriate) designs, which the publisher rejected out of hand. When the author reminded her publisher that their contract specified that the author would have input on the cover, the publisher shrugged it off with an Oh, none of our authors do that, and it’s too late now anyway. I’ve been doing some research; here’s my updated launch timetable. It’s generic enough that you can use it, too. Be sure to stay tuned for ongoing updates. Although it’s one of the most important tasks of marketing, I so do not want to define my target market. I’ll bet a lot of writers feel the same way. Why? I wrote this book for myself. I was my target market. I have certainly not been writing for anyone else. So what’s an author to do…? I don’t even know what I need to do in order to launch my book, let alone how long it will take or when to get started. So how could I put together a launch calendar? Here’s my first attempt, which turned out to be a very good start.